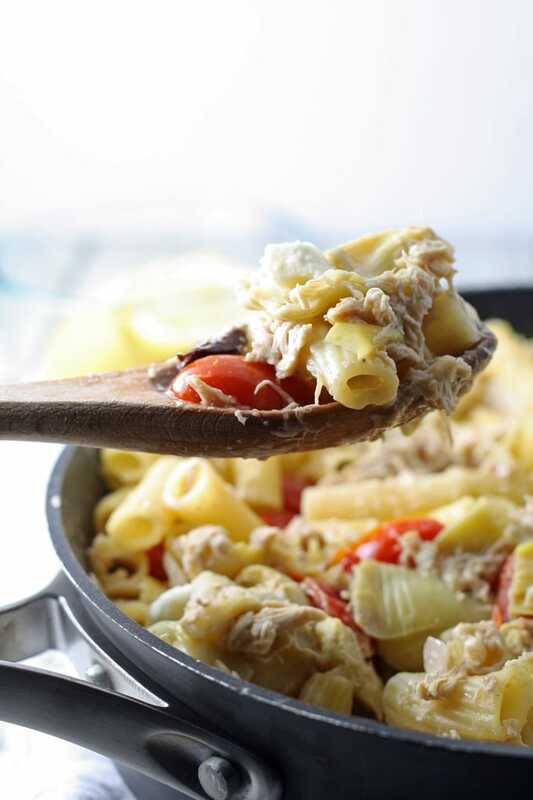 One pot mediterranean chicken feta pasta can be in 30 minutes with a rotisserie chicken. Serve with a cucumber side salad for an easy and delicious dinner! I’m on a one pot meal kick, dear readers, and you’re in for a treat! 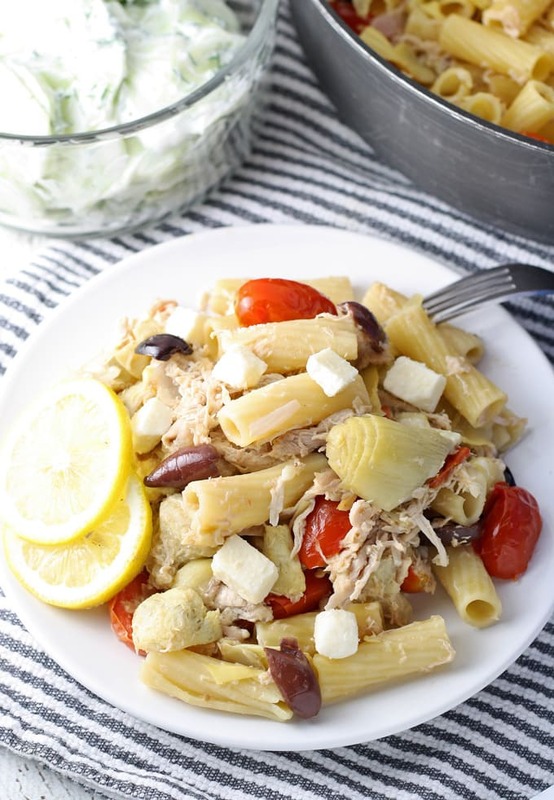 I’ve combined my favorite mediterranean flavors – feta, olives, artichokes and garlic – with chicken and pasta for an easy and delicious dinner. Usually when I make one pot dishes, I use cream cheese. It is great for creaminess, but not only is time to change it up. Feta is a nice twist – while it doesn’t melt the same way, it does melt. 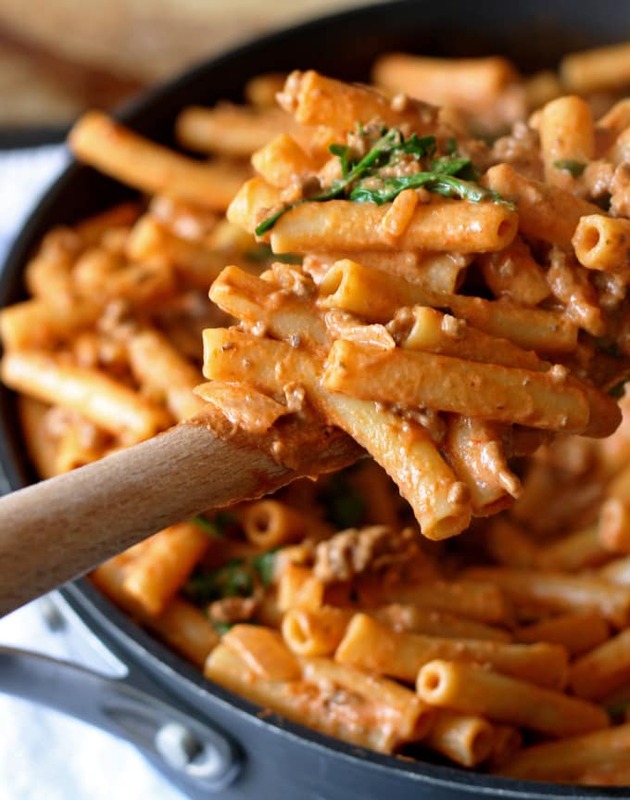 And it adds a strong and bold flavor to the pasta that you just can’t get from cream cheese. 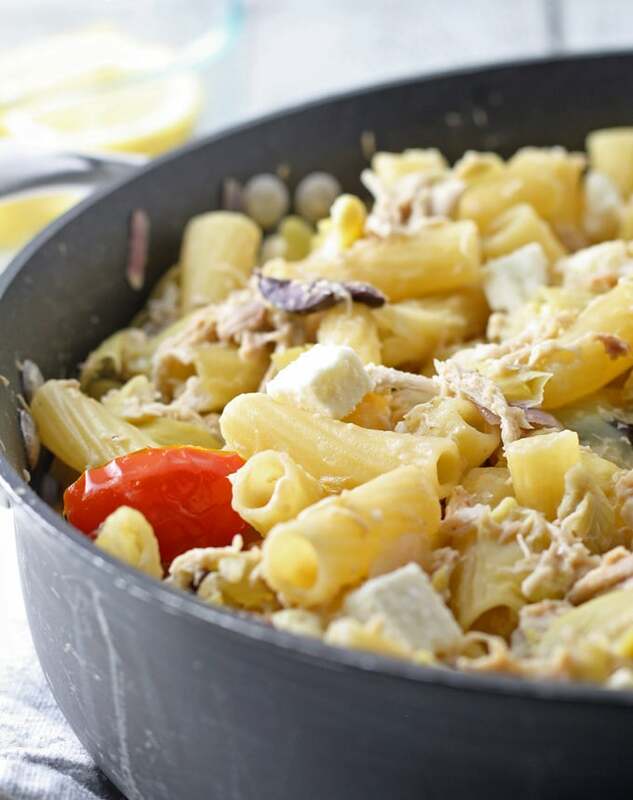 I used Nikos® feta for this recipe because its fresh and healthy. You can rest assured that you’re eating nothing but the best. Their full line of Mediterranean-style feta cheeses are certified Halal and made with rBGH-free milk. One pot meals are not only easy, but often times packed full of flavor. This one pot mediterranean chicken dish does not disappoint. Get it on your table quickly by using a rotisserie chicken from the grocery store. When I want this quick meal, I drive over to the store to pick up a chicken and some Nikos Feta. The other items are pantry staples but if I’m missing one or two I grab them too. When Mr. B gets a craving for One Pot Mediterranean Chicken, I can usually make it in 30 minutes. Especially if I recruit Mr. B to shred chicken or chop veggies for me. Perfectly paired with some crusty bread and a cucumber salad! Heat the olive oil in the skillet over medium. When it is hot, add the red onion and garlic to your skillet. Cook for 2-3 minutes, until the onion becomes translucent. Add the tomatoes and artichokes. Stir and saute for 2 minutes. Add the chicken broth and chicken. Bring to a boil, then add the rigatoni. Reduce heat and simmer for 10 minutes, or until the rigatoni is tender. Stir in the feta, kalamata olives and season with salt and pepper to taste. Serve hot. There can never be enough one-pot meals. 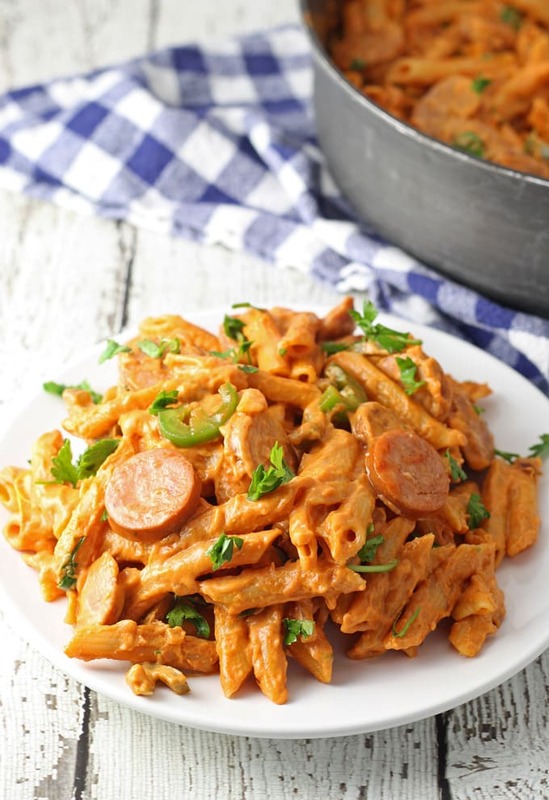 or my cheesy tomato skillet! I ADORE feta and what is not to love about a one pot meal? This is great, Jenny! Yum, you had me at one pot! I love meals that require very little dishes and this one looks delicious! Pinning, thanks for sharing! I love chicken and feta cheese dishes. I can’t wait to try this. OMG! I can have this all the time, just love it! Thanks for joining Cooking and Crafting with J & J Link Up! That looks amazing!!! And so easy to prepare, too! This one pot meal looks SO goooood!! 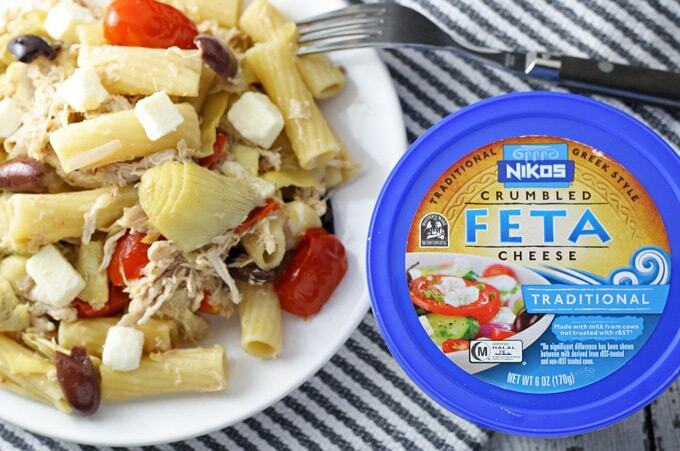 I love feta, and feta with pasta sounds like perfection! Drooling all over my computer screen! Thank you so much for linking up with Thursday Favorite Things this week! 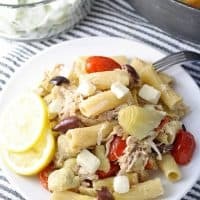 I have been totally craving Greek flavors recently, feta cheese in particular, this one pot pasta dish sounds wonderful! Thanks for sharing at What’d You Do This Weekend? I hope you will join us again next Monday! Wow – great idea for a quick, delicious dinner when it is too hot to cook. 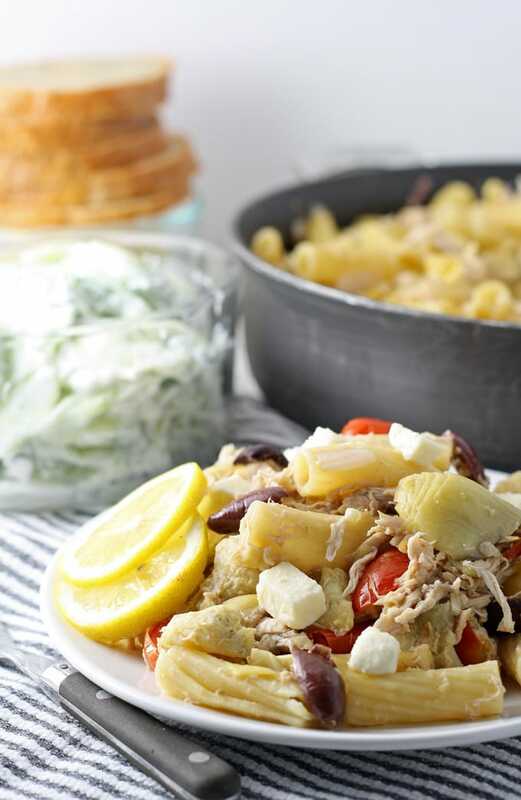 I love greek flavors and this looks very tasty!